Computed tomographic angiography (CTA) utilizing PE protocol. II. 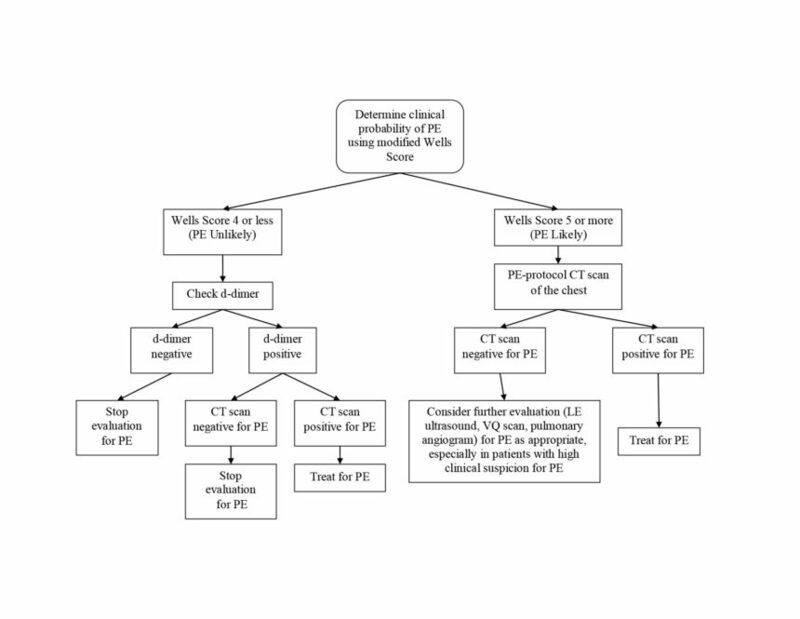 Describe the advantages and disadvantages of this technique for diagnosing pulmonary embolism. Diagnostic for pulmonary embolisms of clinically significant size. Offers excellent anatomic detail of the thorax, including lung parenchyma, airways, and chest wall. Can help differentiate between chronic and acute pulmonary embolic events. Exposes the patient to the risk of contrast induced nephropathy. Exposes the patient to the risk of contrast induced allergic reaction. Pregnancy, especially during the first two trimesters. Creatinine > 1.6. Exceptions can be made on a case-by-case basis. Ventilation perfusion (V/Q) nuclear medicine scan. Ultrasound of the lower extremities, with and without Doppler. V. Describe the advantages and disadvantages of the alternative techniques for diagnosing pulmonary embolism. Preferred in a pregnant patient (utilizing only the perfusion portion of the exam with half the dose of Technetium 99m-MAA. The ventilation portion of the exam is omitted to reduce radiation dose to the pregnant patient). Can be diagnostic for pulmonary embolus. The exam takes about an hour to complete. The patient must be able to tolerate lying supine for the length of the exam. Diagnostic gold standard for pulmonary embolism. Can be therapeutic if direct intraluminal thrombolysis is indicated. Can determine flow dynamics and pressures within the pulmonary arteries. Invasive and associated with a higher morbidity than CTA or V/Q scans. Does not demonstrate the anatomical detail of a CT or MRI. Requires the use of iodinated contrast, which can be associated with an allergy or contrast induced nephropathy. Uses a high dose of radiation. Requires a fluoroscopy suite and interventional radiology. This adjunctive imaging exam can help rule in or out deep venous thrombosis as an underlying cause for pulmonary embolism. Lack of ionizing radiation, particularly advantageous when imaging a pregnant patient. Lack of contrast administration, particularly advantageous when imaging a patient with renal failure or creatinine > 1.6. Relatively cheap and fast real time imaging evaluation. Ultrasound of the lower extremities, with and without Doppler, is a useful imaging study in pregnant patients, patients with renal abnormality, patients in which CTA or VQ scans are relatively contraindicated, and patients with negative/equivocal imaging findings. The quality of the exam is operator dependent. Large body habitus and/or the presence of central lines or overlying bandages secondary to trauma or recent procedure can limit visibility of the lower extremity veins and can thereby reduce the sensitivity and/or specificity of the exam.